Donation: $200.00 (which covers 4 meals [Saturday breakfast, lunch, supper, and Sunday breakfast] and other expenses). Please send the registration form to the Maida Center by July 16, 2019. Registrants will receive detailed information in mid-July. 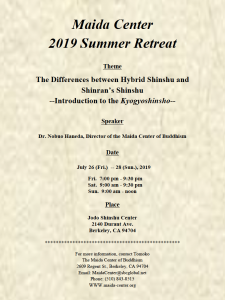 Please send the registration form to the Maida Center by July 10, 2019. Rooms will be available on a first-reserved basis.